A son, Robert was born to William Duke of Normandy and Matilda of Flanders. He was known as Robert Curthose because he had short legs. Robert’s brother, Richard was born to William Duke of Normandy and Matilda of Flanders. Robert’s sister, Adeliza, was born to William Duke of Normandy and Matilda of Flanders. Robert was betrothed to Margaret, heir to Maine. He was created Count of Maine following the betrothal ceremony. Robert’s betrothed, Margaret of Maine, died. Robert’s father, William, assembled a fleet of ships to carry his army across the Channel to England to take the throne of England from Harold Godwinson. Robert’s father, William, sailed for England. 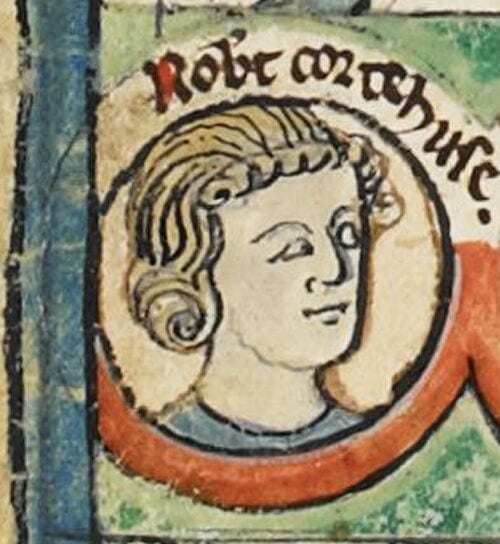 He Robert’s mother as regent of Normandy in his absense and Robert helped his mother with administrative tasks. Robert’s father, William, beat Harold Godwinson and the Saxon army. Harold was killed during the battle. Robert’s father was crowned King William I of England in Westminster Abbey. Robert’s mother Matilda went to England to be crowned Queen. Robert was left in charge of Normandy. Robert’s mother, Matilda was crowned Queen of England in Westminster. She was the first Queen of England to be formally crowned. Robert’s brother, Henry, was born in Selby, Yorkshire. He was the first of William’s children to be born in England. The county of Maine revolted against Robert and his father and Hugh, son of Azzo d’Este, was invited to become Count of Maine. Robert’s brother, Richard, died while hunting in the New Forest. Robert was livid when his younger brothers William and Henry, emptied a chamber pot over his head and a fight broke out between the three young men. Robert was further angered when his father, William I, failed to take action against his brothers. Robert, who wanted more responsibility and power, led a revolt to take Rouen from his father. The revolt failed and Robert was forced to flee to Gerberoi in Flanders. Robert invaded the Vexin which was held by his father. Robert managed to knock his father off his horse during a battle. He recognised his father’s voice and avoided killing him. Robert and his father settled their differences after the intervention of Robert’s mother, Matilda. Robert was sent on a campaign against the Scots. He succeeded in raiding as far north as Lothian and built a castle at Newcastle on his return to England. Robert’s father, William I, died in Normandy from an injury he received in July 1087. Robert inherited Normandy, his brotherWilliam inherited the English throne as King William II and his brother Henry inherited a sum of money. Robert, as the eldest son, felt that he should be King of England and planned an invasion to take the crown from his brother, William. He asked his younger brother, Henry, to loan him some money to finance the venture. Henry initially refused but then came to an arrangement whereby Henry purchased lands in the Cotentin for a sum of money. Henry was given the title Count of Cotentin. Robert’s uncle, Odo of Bayeux, led a rebellion of a large number of barons against William II. Like Robert, they believed that he should have inherited both England and Normandy. The rebels made their base at Pevensey Castle but William II successfully lay siege to the castle and the rebellion was put down. Odo was banished to Normandy. Robert seized his brother Henry when he returned to Normandy. Robert’s uncle, Odo of Bayeux, had convinced Robert that Henry was conspiring against him. Robert had took back Henry’s lands and title in Cotentin. Relations between Robert and William II of England continued to be strained. William II persuaded Conan Pilatus to rebel against Robert. Robert, but he was defeated by Robert’s brother, Henry. Robert and William lay siege to their brother, Henry’s forces at Mont St Michel. Henry fled to France. Malcolm Canmore of Scotland invaded England in support of Robert’s claim to be the rightful King of England. This treaty agreed a peace between Robert and his brother William II. Robert managed to withstand a further invasion by his brother, William. Pope Urban II called a First Crusade “to regain the Holy Lands taken in the Muslim conquests of the Levant.” Robert decided to join the Crusade. To raise money for the venture he leased his lands to his brother William II. Robert married Sybilla de Conversana, daughter of Geoffrey of Brindisi. Robert’s brother, King William II was killed by an arrow while hunting in the New Forest. His younger brother, Henry had taken the throne of England as King Henry I.
Robert arrived back in Normandy and learned that his brother had seized the English throne. He believed that the throne should have been his and planned an invasion. Robert landed at Portsmouth to lay claim to the English throne. Many influential barons led by Robert of Belleme flocked to his side, believing him to be the true King of England. However, the former court of William II, led by Robert of Meulan and the English church remained loyal to Henry. Conflict was avoided when both sides agreed to negotiate. After extensive negotiations, a peace treaty was signed that agreed that Henry should keep England but pay Robert a pension of 2,000 marks per year. A son, William Clito, was born to Robert Curthose and his wife Sybilla of Conversano. Robert’s wife, Sybilla died at Rouen. She was buried in Rouen Catheral. Robert Fitzhamon, working for Henry I, entered Normandy. Robert ordered his capture and imprisonment at Bayeux. Henry I then invaded Normandy in protest at Fitzhamon’s imprisonment and placed Bayeux under siege. Bayeux was burned after refusing to surrender. Having seen the fate of Bayeux the town of Caen surrendered to Henry. A new peace treaty between Henry and Robert Curthose failed and sporadic fighting dragged on throughout the year. This decisive battle between Robert and Henry saw Robert’s smaller army defeated. Robert was captured and sentenced to indefinite imprisonment. Robert was imprisoned in Devises Castle. Henry attempted to capture Robert son, William Clito but the young Duke’s protectors learned of the scheme and moved him to Flanders. Robert was moved from Devises Castle to Cardiff Castle. Robert died in Cardiff Castle.